A warrior desires a sword, and a sword desires truth. THANK YOU BLIZZARD, THANK YOU FOR THIS GREAT GIFT. I swear, if I don't see Arms Warriors, Blood/Unholy Death Knights, and Retribution Paladins using this while spamming quotes from Soul Calibur, I'll be sad. Not sure how a Fury Warrior should do the quotes, what with no character with large weapons having two Soul Edges at once. Maybe using Bloodthirst while dual wielding this and Xal'atoh, entweihtes Abbild von Blutschrei, saying "My thirst is endless!" ? EDIT: Algol, that crazy ancient king from 4 and 5, "dual wields" both swords. He's such a forgettable character. Macro Recklessness, Avatar, and Skull Banner with the following phrase; "This is... true power! ", and you are as nutty as Algol. Wonder what it will look like on Raid Finder, Flex, and Heroic, if it changes looks. the question is: why doesnt it have a sha touched socket ? First time 2H looks interesting! I find it pretty lame on Blizzard's part that all four different versions from the four different raid difficulties are colored exactly the same... Especially since Blizzard does in fact have recolors of all of the weapons already. I'm not sure why they're not using them, but it's not just the case for this sword, it applies to all of the weapons from SoO. Different colorations not only give visual proof of which difficulty you got your weapon from without having to inspect a given person, they also allow for matching up with various transmogs you might use. I hope they'll change it, but I doubt it at this late date, given that everything is in the dungeon journal already. 3d model shows sha smoke effect as purple, let it be known that it is red. Why did the sha chew some bubble gum and rub it over a sword? So they finally added raid finder colors. I am so keeping this. The green version is just wicked. What a gorgeous sword, both stat and lookswise. 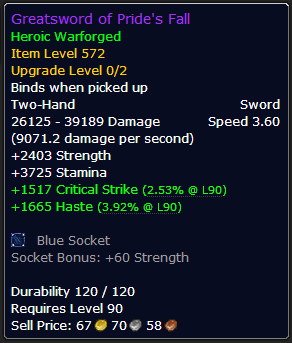 As one of those few Warriors who still play Arms as their main spec, this is a very good weapon, The Socket could be better, but slap a Crit/Hit gem in there and presto, it should last you a good long while. To bad we can use the sha socket on this one. That would top the cake with a cherry. Too bad this sword does not have a yellow variant, for paladin transmog sets that are usually golden. if you view this in the 3d model remember that this version has a green sha smoke effect, not purple like shown. Also the heroic version has a red smoke effect not purple as shown. Eye of the Black Prince won't work on this sadly. Vegta, What does the swords DPS say? BiS for Retribution Paladins if you're Human. Otherwise Britomarts gezackte Pike is better.